Granite is a very dense, hard stone. It is most familiar with a highly polished finish. A polished finish (see its separate page) is extremely low in absorption and is not susceptible to acidic liquid damage. Therefore, many (not all) polished granites need little protection from a sealer. However, honed and flamed finishes do have some absorption and do require sealing for stain protection. (See other page for honed and flamed finish). Timeless, classical beauty. The great variety of colors and patterns allow for a wide spectrum of design options. Although polished granite will bead water, there may be sufficient (invisible to the naked eye) "micro crack" separations between granite particles to allow the entrance of a highly penetrating staining liquid allowed to stand for a length of time. Once past the polished finish, these liquids are in contact with the absorbent natural stone. Phenol based cough syrup, some fruit juices, etc. have managed to do this. To deal with this type of stain situation, click here. When you compare polished marble and limestone to polished granite, it is often difficult to tell which is which. You cannot tell by look or feel. As granite does not react with acidic liquids, cleaners are not a concern unless they can create a stain. Sealing options are below. Here is how you can do an acid test to confirm which you have. Be sure to test on the underside as acid will etch marble and limestone faces. #2. If the Polished Granite is grouted, but never sealed. #3. If the Polished Granite has had a sealer applied in the past. "S-B-S Sealer" . This sealer is | Solvent Base | Penetrating Type. Provides: color enhancement | low gloss | strengthening | efflorescence barrier. Coverage guidelines (depending on absorption) 150 to 500 sq.ft./gal. Why only this one choice? 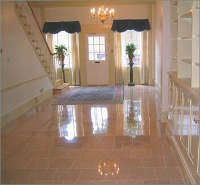 A polished stone finish has unique criteria that limits choices in sealing. It is usually desirable to not have an observable change to the factory polished finish. A sealer applied with an applicator tool (brush, roller) usually leaves streaks on this kind of surface. This criteria dictates the use of a sealer that can create a thin and invisible coating that will repel oil and water type liquids. And can be applied as a spray. S-B-S Sealer is the best choice for this and it also comes in aerosol cans for spraying. You can see a video of how easy a process this is here. Add one application of "Lifeguard" for another level gloss. You can increase gloss with more applications as desired. Easy Care Products: for a Granite floor. "Maintain" - for no streak wet mopping of Granite and all other types of flooring. You may have heard of concerns about Granites. All of them would be prevented with the information we provide here. Therefore, you can have the floor you want!